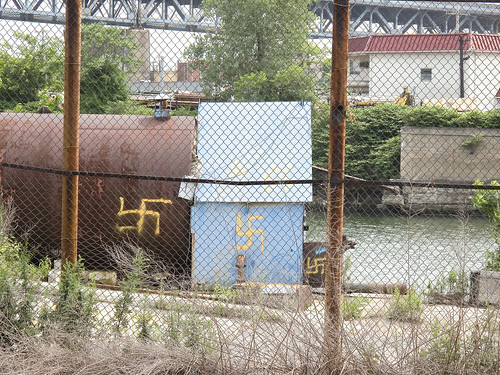 Our pal Rob over at thismyshiznat.com turns his attention to a Newtown Creek tale here. This one is about a guy who decided to drill for oil in Brooklyn, into the subterrene Greenpoint Oil Spill, in his yard. Anything you may experience, in situ, by following these walking directions is at your OWN RISK, and is offered by the Newtown Pentacle for documentary and entertainment purposes only. Remember- the rule we follow at the Newtown Pentacle is to NEVER trespass. Like Vampires, Newtownicans should wait to be invited into a house before they can do their work. Also, Please note — if something you read here is inaccurate, DO NOT BE SHY- contact me– additions and corrections are always welcome at the Newtown Pentacle. 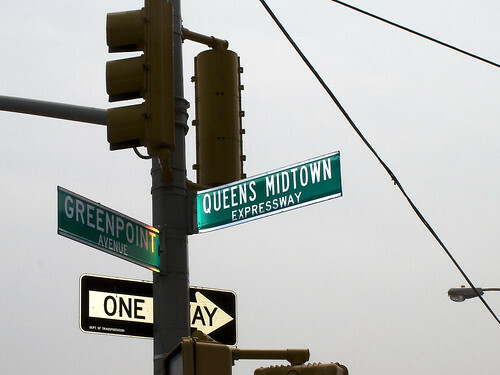 Walk past a gas station (last chance for water or gum) on your right, and you’ll be at the corner of Greenpoint and the Queens Midtown Expressway. 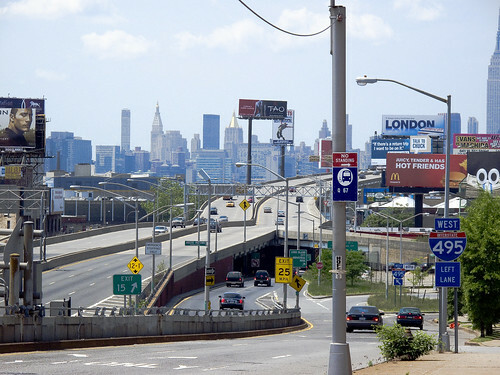 To your right is Manhattan, and the elevated phase of the Queens Midtown Expressway which carries vehicular traffic over Long Island City and the Dutch Kill. That’s Borden Avenue down there, under the elevated highway. Don’t worry, I’m taking you there in a few weeks. Today, we walk widdershins around the dead. Dead is what you’ll be if you don’t pay attention when crossing this street. Luckily, where we’re heading- you’ll fit right in. This may be a good time to remind you of a Newtown Pentacle posting from a few weeks back- “The Cemetery Belt“. CALVARY CEMETERY. This cemetery, which is located at Laurel Hill, was set apart and consecrated in 1848. It is one of the most accessible rural cemeteries near New York, and it would be difficult to select a lovelier or fitter spot as a place of sepulture. 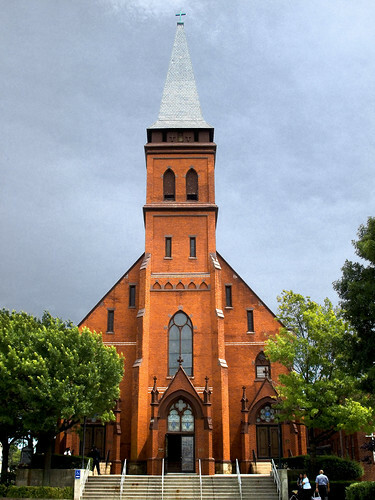 The old ground comprised one hundred and ten acres, but in 1853 a charter was obtained from the State by the trustees of St. Patrick’s cathedral, New York city, for 250 acres; 165 acres of this are now enclosed. The artesian well in that part of the enclosure called New Calvary was sunk in 1879. It is 606 feet deep and 6 3/4 inches in diameter, and was bored in white granite for a large part of its depth. 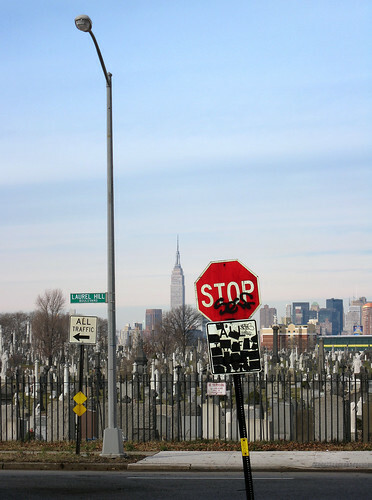 Last year 32,000 persons died in the city of New York, and of this number 15,500 were buried in Calvary. The cemetery keeps one hundred and fifty men regularly employed, and two hundred more are kept at work by the relatives and friends of the deceased. Here may be found some of the choicest of materials and the finest models in monumental structure; and here we may mention as worthy of note the vault and chapel built by John Johnston, at a cost of $75,000, and regarded as one of the finest to be found in any ground. This cemetery is to the Catholics of New York what Greenwood is to the Protestant population. Since 1872 Hugh Moore has been the general superintendent, and to his ability much of the beauty and attractiveness of the place is due; he has been assisted by Michael Rowen. The mortuary chapel, of fine architectural design and finish, was built in 1856. The present chaplain is Rev. M.J. Brennan. The shadowed lanes of Calvary await your hungry eyes, but we are not entering the necropolis today, dear reader. Instead, we’re lurking around its nitre dripping fenceline, scuttling along the broken pavement and visible cobblestones of Greenpoint Avenue to the corner of Bradley Avenue, where we will turn widdershins (left). 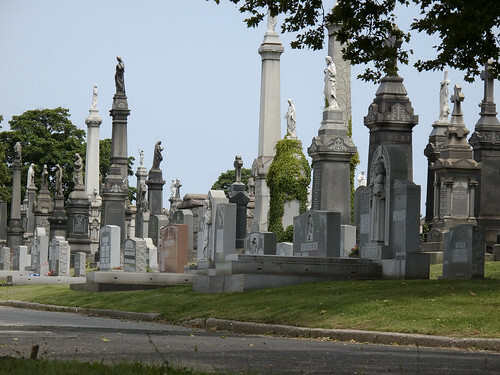 Click here for a Wikipedia page on Calvary Cemetery, to familiarize yourself with the story of this extraordinary place and the people who chose this as their final address. 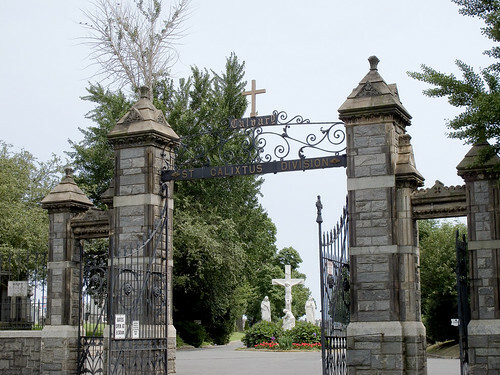 To the modern mind, the Greenpoint Ave. gates of Calvary are the obvious main entrance to the place due to their proximity to the highway- but the actual street address of Cavalry is at 49-02 Laurel Hill Blvd.- which is on the Newtown Creek side (we’re going there, don’t worry). When this place was built, the Newtown Creek was the central artery of the surrounding communities, not the barrier that modernity has made of it. Often, as I am out exploring these areas (in the early 21st century), I’m asked by neighborhood people- members of a long abused community which is wary of strangers – what I’m up to. I’ll explain my interest in the area and then be asked “What’s Newtown Creek?” by people who live in Greenpoint or Long Island City. Manhattan people think you’re just making it all up- they say “how can that be? You’re exaggerating” when you tell them about this place. If members of “the community” aren’t even aware that the Creek exists, how can we ever hope to coerce our political class to address its many problems? Please, bring your cameras down here and peek under a few rocks yourself. Tell the story of this place. 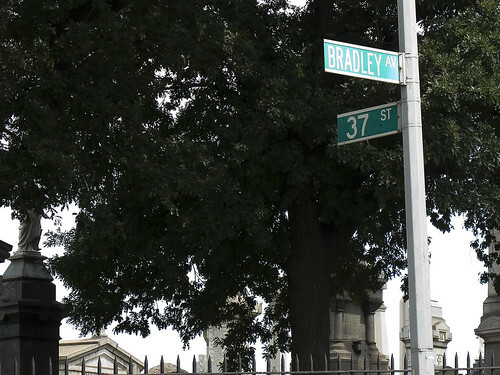 Bradley Avenue is truncated by the iron fencelines of Calvary, and we’re going to follow the dead end here, onto 37th street. I often wonder, when the fences of Cavalry are closed, what sort of things transpire in this lonely place. As we proceed down 37th street, the street elevation begins to drop down toward the Newtown Creek shorelines, but Calvary remains at the same grade level as Greenpoint avenue. A lonely industrial block, 37th street also hosts several homes of taste and substance near its intersection with Review Avenue. We turn widdershins again, to the left on Review. At the corner of Review, looking to your right, is the Greenpoint Avenue Bridge. Greenpoint people will find this a pleasant crossing over the Newtown Creek and a reference point for negotiating this lonely part of Long Island City. On Review Avenue, the wall of Cavalry looms. That’s the Kosciuszko bridge in the background. The cyclopean scale of Cavalry is apparent here, and behind that masonry lie the dead. As you continue down Review Avenue, you’ll be passing the old LIRR Penny Bridge station at the corner of Review and Laurel hill Blvd. Now dear readers, this is your first revelation of a master plan behind the Newtown Pentacle. I am willing to reveal that everything is connected. This corner is where the post “Dead Ends, A short walk from Maspeth to Calvary” ends. 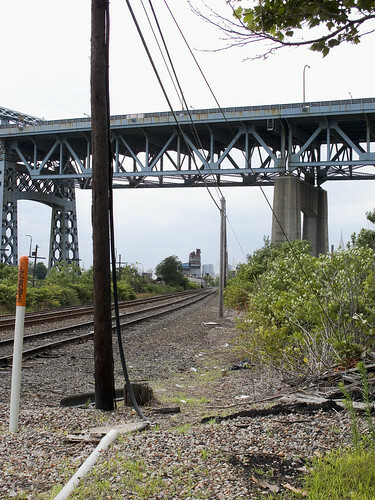 That post picked up where “the Wrong side of the tracks, a walk in Maspeth” ended. Turn Widdershins on Laurel Hill Blvd. Commanding views of Calvary can be had here. The elevation rises, and St. Raphael’s comes into view. As you proceed, on the other side of the BQE will be a heavy manufacturing zone with relict housing interspersed. The area has an aura of long time municipal neglect. At the end of Laurel Hill Blvd, you will find a pedestrian bridge which is covered in a tightly woven chain link fence. Except for this spot, at tripod height, that was cut by some photographer in the past. The same person (same cut pattern and size) was also nice enough to cut a hole in the fence on the Pulaski Bridge. Our pals at the Newtown Creek Alliance and the Working Harbor Committee are offering a cruise up the Newtown Creek. Departs at 1:00 P.M. sharp from Skyport Marina, East River at 23rd Street, Manhattan. Souvenir Tour Brochure with historical information and vintage maps. Narration by experienced historical and environmental guest speakers. Complementary soft drinks will be served. 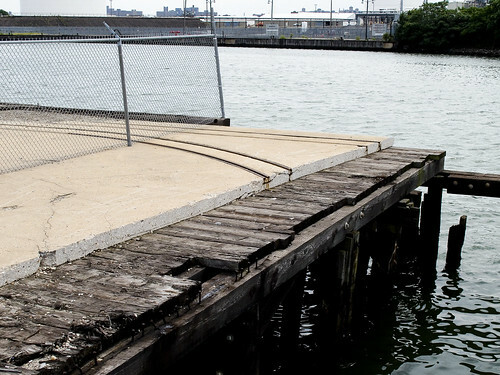 Come aboard for an intense Newtown Creek exploration! 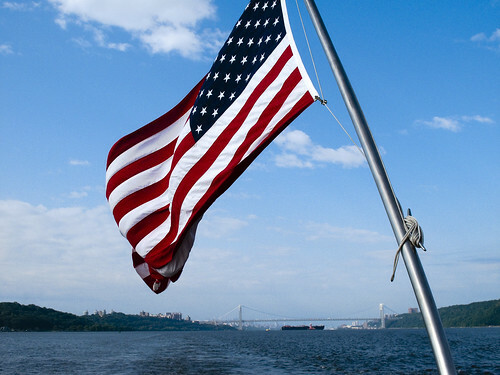 Our comfortable charter boat will travel the length of Newtown Creek. We will also cover English Kills. The tour will pause at interesting locations for discussion. Guest narrators will cover historical, environmental, and conservation issues.The Greenpoint Avenue and Metropolitan Avenue bridges will open on our signal so we can view the furthest reaches of English Kills. Cruise runs rain or shine. Cruise sponsor is The Working Harbor Committee. Cruise co-host is the Newtown Creek Alliance. I went on this last year, and am doing so again this time. Check out some photos from the trip here. Agenda: BOA, Stormwater Grant, NCA website, and announcements. Location is the Green Oaks Citizens Club, 179 Green St off of Manhattan Avenue. By public transportation: B61, B43, B24 bus to Manhattan Avenue; Subway “G” train to Greenpoint Avenue Station, walk north on Manhattan Avenue, make right on Green. Walk/bike from Queens over the Pulaski Bridge; west off bridge to Manhattan Avenue to Green Street. for more info, visit the NCA site. So, last time, I left you on the wrong side of the tracks in Maspeth. Sorry, it can be a very nice place, and there is extremely good italian food for sale in the residential parts of Maspeth that shouldn’t be missed. Check out a google map of this post here. The previous Maspeth walk map can be found here. This walk is one that would be quite familiar to anyone living in the last century. 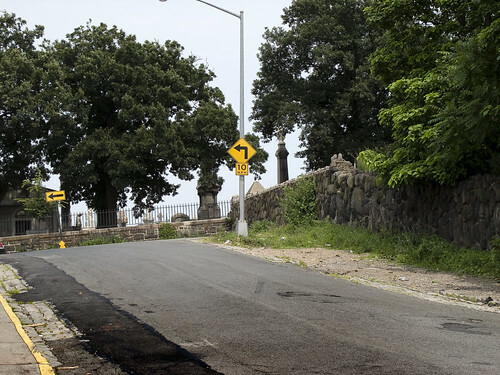 If one was visiting a grave at Calvary, from the Brooklyn side, you’d cross Penny Bridge or the Maspeth Avenue Plank Road and head to Laurel Hill. This is a heavily industrialized section of the Newtown Creek, one which has fallen into a sort of holding pattern over the last couple of decades. Once upon a time there was a copper refinery here, one that was owned by a company called Phelps Dodge. 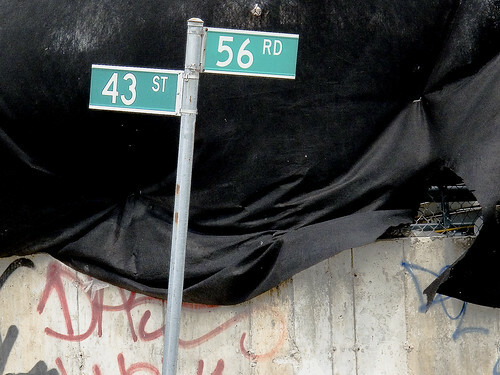 At 43rd street, look to your left and see a railroad track, and the crossing over to 57th avenue. That’s Restaurant Depot on the left, the Newtown Creek is dead ahead. That’s Brooklyn on the horizon. A history of the Laurel Hill Chemical works from the beginning in 1852, from the Phelps Dodge Corporation Laurel Hill Plant Records, 1893-1983. The following is a chronology of Phelps Dodge Corporation’s Laurel Hill Plant starting with William Henry Nichols, the man who co-founded the original chemical plant, G.H. Nichols and Company at the site in 1872; continuing to when it was purchased by Phelps Dodge Corporation in 1930; and ending in 2000 when all the structures were finally demolished. William Henry Nichols was born to George Henry and Sara Elizabeth (Harris) Nichols in Brooklyn, New York, January 9, 1852. William Henry Nichols and his friend Charles W. Walter started making acids. To expand their acid production to sulfphurc acid and support their entrepreneurial needs William H. Nichols and Charles W. Walter, with the financial backing of William’s father George Henry Nichols, formed the G. H. Nichols and Company. The new company so named, because not only did George Henry provide the majority of the capital, but also the two men were too young to incorporate a company in New York State. 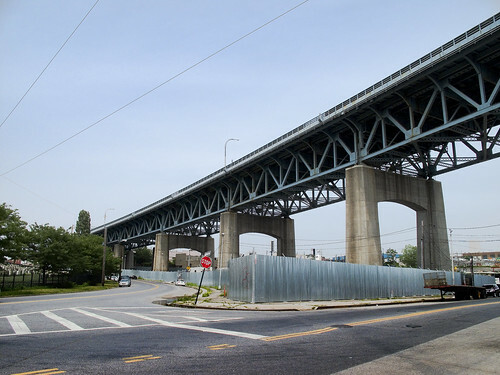 During the year the company began purchasing land and building buildings in the Laurel Hill (now Maspeth) neighborhood of Queens, New York on Newtown Creek. Not only did the site offer good fishing, it afforded convenient water and rail transportation to move their raw and finished material. Their sulphuric acid, produced from brimstone, was stronger than the industry standard upsetting their competition but greatly increasing their market share. The company and adjoining landowner Samuel Schifflin purchased and filled in a portion of Newtown Creek. The company developed and installed a special burner at the plant to produce sulfuric acid from pyrites, a cheaper raw material with a stable price. They purchased a Canadian pyrite mine to ensure a steady supply of the raw material. The by-product from this process is copper matte which they sold. 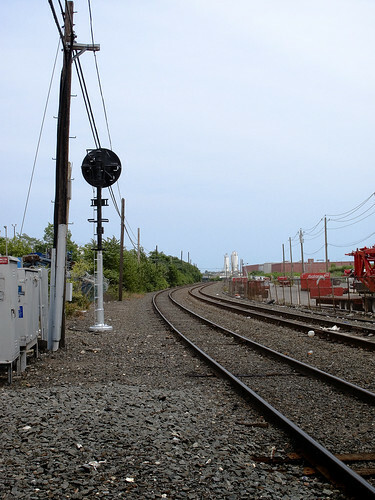 During this year the company built and renovated a number of buildings on the grounds including: two shops on the south side of the South Side Rail Road tracks (now owned by the Long Island Rail Road); a building built by Samuel Berg Strasser and his employees; and large additions to buildings on both sides of the railroad tracks. The company continued to enlarge and improve their plant and docks and lighters were used to ship their acids on Newtown Creek. The company purchased four acres from the Rapleye Estate on Washington Avenue (now 43rd Street) and surveyed the land for a machinery and acid manufacturing building. Construction began on the new building that extends the entire block on Washington Avenue to the railroad. A confluence of two issues, their copper matte stopped selling and the copper refinery industry’s need for a proper method for analyzing the metallurgy of copper, propelled the company to discover a new process to refine copper called the electrolytic method. This process was a commercial success producing almost 100% pure copper which they named, the famous brand, N.L.S. (Nichols Lake Substitute) Copper. This year the company built two new acid manufacturing buildings, the first of this kind in the world. William Henry Nichols renamed the company from G.H. Nichols and Company to Nichols Chemical Company. The new company was incorporated the week of January 8, to manufacture sulphuric, muriatic, nitric, and acetic acid, other chemicals, and by-products. A new four story 200 foot by 120 foot building was built on Newtown Creek. The first contract was signed by Phelps Dodge Corporation and the Nichols Copper Company to have Phelps Dodge deliver a minimum of 1,000,000 pounds of blister copper over three years. This began an economically symbiotic relationship that lasted until 1922, in which Phelps Dodge provided 90% of the blister copper Nichols Copper Company used to produce almost 100% pure copper. The first important merger of chemical companies in the United States occurred when twelve companies with nineteen plants merged to create the General Chemical Company with William Henry Nichols as chairman. The Nichols Chemical Company sold its Laurel Hill Plant and land to General Chemical for $250,000. This same year plans were filed for the erection of their, 315 feet high and 36 feet in diameter, steel chimney. On the plant grounds, General Chemical erected the tallest chimney in the United States to blow the smoke and gases from its furnace away from the neighborhood. For the past number of years neighbor surrounding the plant complained vociferously about the pollution from the factory. Only after a study found that nitric, muriatic, and sulphuric acids from the plant were destroying local cemeteries’ tombstones did the company try and alleviate the problem by building the chimney. This same year the company filed plans with the New York City’s Department of Buildings in Queens to build another 150 foot chimney, an ore breaker, a storage tank, a boiler house, and a stable. A fire, started in a building used to manufacture sulphite of copper, destroys this building and two others causing $250,000 worth of damage, to this date it was the most costly fire in Newtown. For $42,500 the company purchased from Alice H. Stebbins a major tract of land whose border was 200 feet on Locust Avenue (now 44th Street), 725 feet on River Avenue (47th Street if it extended to Newtown Creek), 825 feet on Clinton Avenue (now 56th Road), and 195 feet on Newtown Creek. That same year for $25,000 they purchased another tract from Alice H. Stebbins, Mary S. Dodge, Mary J. and William J. Schiefflin, and Eleanor J. Taft whose border was 828 feet on Clifton Avenue (46th Street if it extended to Newtown Creek), 200 feet on South Avenue (a street that was on the south side of the South Side Rail Road tracks), 755 feet on River Avenue (47th Street if it extended to Newtown Creek) and 195 feet on Newtown Creek. 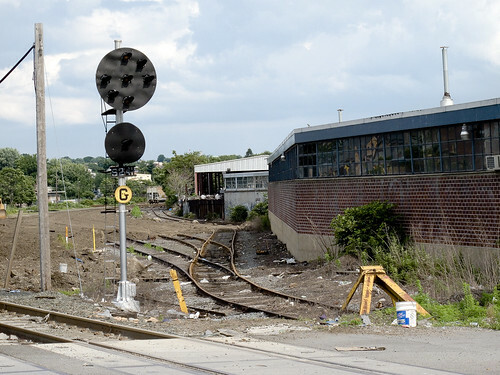 Another major fire occurred at the plant causing $100,000 worth of damage to a building 200 feet along Washington Avenue (now 43rd Street) and 200 feet along the Long Island Rail Road tracks. During this year the landscape of the neighborhood changed considerably with the removal of the streets, Washington, Clay, Hamilton, Fulton, Clifton, and River Avenues, on plant property between the railroad tracks and Newtown Creek. Also the railroad tracks were elevated and the remaining part of Washington Avenue was made a private road. This same year the company stated that they will be increasing their workforce from 1200 to 5000 people. The plant received 150,000 tons of copper ore. 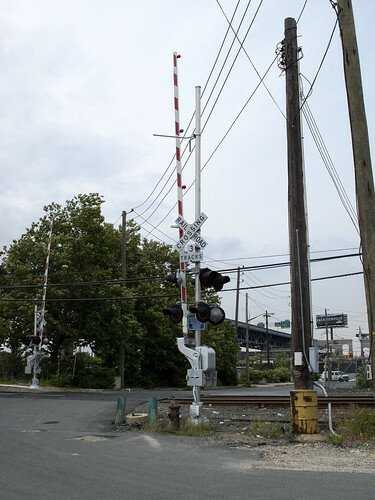 The company received approval from the New York City Board of Estimates to build a boardwalk on the stretch of land on the north side of the railroad tracks, nicknamed “Death Avenue” for the many pedestrian fatalities involving trains. The company employees 1,750 people. 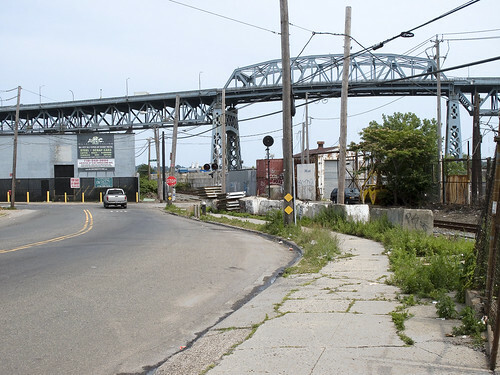 Along with other companies along the creek they petition the city to close the streets that were not officially opened between the railroad tracks and Newtown Creek. 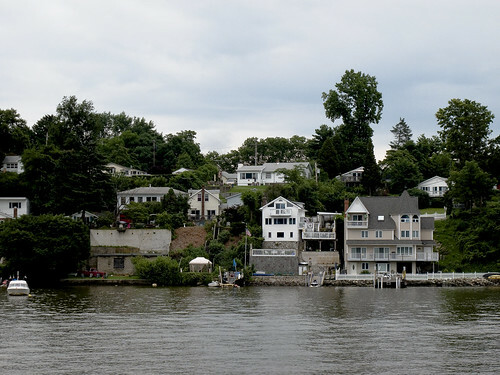 The petition was denied by the city and the borough because it would eliminate miles of streets and cut off public access to the waterfront. 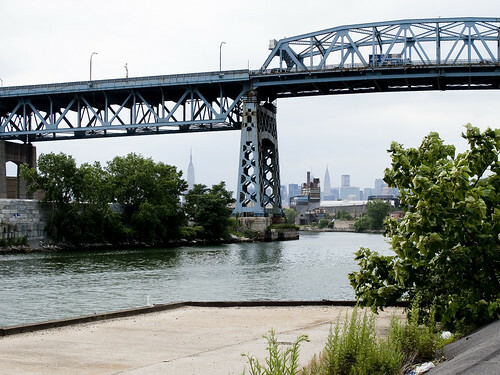 Property is expanded when the company filled in some of Newtown Creek. That same year the company was expected to be tried for illegally building a freight shed on a portion of Creek Street (57th Avenue if it extended into the plant). In exchange for stock in the company Phelps Dodge invested $3.5 million in Nichols Copper Company’s plant modernization projects. This increased the production of copper dramatically at the plant. Dr. William Henry Nichols died. This same year, Phelps Dodge bought the Laurel Hill Plant. The following products were produced at the plant: copper, silver, gold, copper and nickel sulphates, and small amounts of selenium, tellurium, platinum, and palladium. This same year more of Newtown Creek was filled in giving the plant its final size of 35.60 acres. During this decade the plant began importing blister copper from Africa, South America, and scrap copper from other cities, after Phelps Dodge built a refinery in El Paso, Texas. The company constructed additions to the plant’s electrolytic tank house to increase there capacity to 35,000 tons of refined copper per month. They also increased the production of wire bars. In 1956, the plant was comprised “of a custom smelter, copper refining, and copper sulphate plant. The smelter produces blister copper from the treatment of ores, concentrates, and various kinds of scrap and copper bearing materials. The refinery treats the blister copper produced by the Laurel Hill Smelter, blister and anode copper received from others on custom basis, and high grade scrap copper. Several types of copper sulphate are produced and some refined nickel sulphate.” The plant experiences an unauthorized employee strike from January 10 – February 12. The customer smelter at the plant is permanently closed in August 1963, because the limited availability of scrap copper and other raw materials and “declining treatment toll margins among custom smelters” made the smelter unprofitable. People were laid off, the smelter was dismantled, and the parts were sold. The El Paso Refinery was able to maintain the company’s production levels. Capacity of the multiple refining system was increased by 24,000 tons per year and a gas fired vertical melting furnace was installed. The furnace for removing insulation from copper wire was “placed in limited operation,” and a new building to house equipment for the receipt and sampling of incoming materials was completed. Installation began in December of a new anode casting furnace with a waste heat boiler and a new anode casting wheel. On November 1, 1971, the company permanently shut down part of the plant’s electrolytic tank house and ceased the treatment of #2 scrap, because the facilities were built prior to 1900 and were becoming too expensive to maintain and operate. The El Paso Refinery was able to fulfill the company’s production needs. The company closed the plant permanently in February 1984, due to high costs and changing markets. The plant’s final products, which they had been producing throughout the twentieth century, were copper, silver, gold, copper and nickel sulphates, and small amounts of selenium, tellurium, platinum, and palladium. The El Paso Refinery was expected to fulfill the company’s production needs. The company sold the land to the United States Postal Service on September 1986. The postal service sued the company because they did not sufficiently clean up the site and the court ordered Phelps Dodge Corporation to buy back the property. All the buildings were torn down. Phelps Dodge once operated a copper refining and chemical production facility at this location. Currently Sagres Partners (a subsidiary of Galasso Trucking) owns the center of the site and has leased the space to Restaurant Depot, Boston Coach, and Galasso Trucking. The properties leased to Boston Coach and Galasso Trucking serve as storage lots for their vehicle fleets. Restaurant Depot (a subsidiary of Jetro Holdings) is wholesale food warehouse franchise. 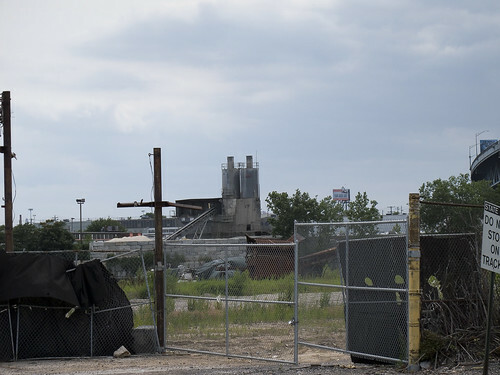 Phelps Dodge maintains ownership of the empty rubble strewn eastern and western sections of the site, though Sagres Partners has contracted to buy these properties at a later date. These parcels will need to be capped with clean soil and pavement before they can be developed. 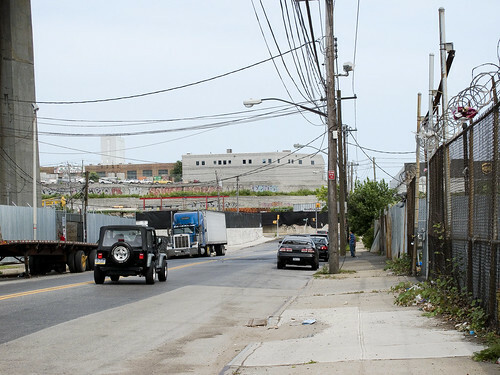 The fifteen foot wide strip of land that runs along the border of Newtown Creek will remain the property of Phelps Dodge indefinitely, as they are responsible for maintaining the retaining wall and groundwater pumps that prevent toxic soil and groundwater from migrating into Newtown Creek from beneath the site. Previously barring entrance to the western third of the site, this sign has now been taken down. According to a report by Cushman & Wakefield filed with the Securities and Exchange Commission, Sagres Partners sold three parcels of land from the former Phelps Dodge site to three separate entities in 2005. A 108,900 sq. ft. parcel was sold to Radhaswamy for $8 million, a 65,000 sq. ft. parcel was sold to Montebello Italian Food Company for $5.4 million, and a 120,000 sq. ft. parcel was sold to Thai Food Company for $9.8 million. By Summer 2008 none of these entities had developed their properties and it is not known whether they still own them. In 2007, Phelps Dodge Refining Corporation was acquired by Freeport-McMoran Copper & Gold Inc., the world’s largest publicly traded copper company, for $26 billion. Headquartered in Phoenix, Arizona, Freeport-McMoran conducts its business through its principal operating subsidiaries: PT Freeport Indonesia, Phelps Dodge, and Atlantic Copper. Freeport McMoran principally mines copper, gold and molybdenum and they have mining operations throughout the Southwestern United States, Peru, Chile, Indonesia, and the Democratic Republic of Congo. According to an investigative report by the New York Times Freeport-McMoRan bribed Indonesian politicians and military officers and utilized the Indonesian military to threaten, harass, and kill those in opposition to their mines and mining practices. In addition, Freeport-McMoRan has dumped millions of tons of toxic mine tailings into watersheds in Indonesia thereby polluting the environment, destroying livelihoods, and poisoning thousands of people. The Phelps Dodge Laurel Hill Industrial Facility circa 1933. All the buildings pictured were demolished in 2000. After 113 years of continuous industrial copper and chemical production, the Phelps Dodge Laurel Hill Works industrial facility ceased operations in December of 1983. After shutting down, the property lay vacant for several years until the US Postal Service agreed to buy it in 1987 for $14.7 million. 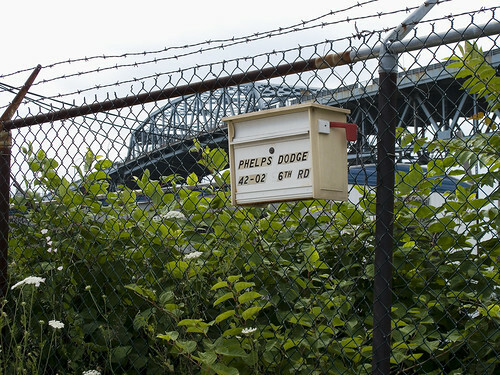 Much to their chagrin, the Postal Service soon discovered that the property was too polluted to develop leading to a 1992 lawsuit against Phelps Dodge by the US Attorney General. The suit was settled in 1997, the terms of which required Phelps Dodge to take back the property, remit the purchase price plus interest, and enter into negotiations with the NY State Department of Environmental Conservation (DEC) to arrange a clean up of the property. Two years later, in 1999, Phelps Dodge negotiated a Consent Decree with DEC to develop a remedial action plan for the site. 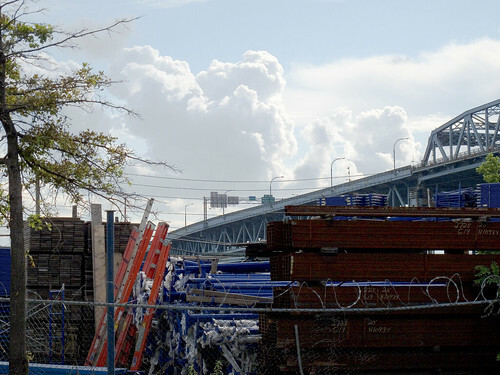 In 2000 the site was razed and thousands of tons of hazardous soil and sludge (contaminated with cadmium, chromium, copper, lead, mercury, petroleum hydrocarbons, PCBs and more) were hauled away and a retaining wall and groundwater pump were installed along the creek-front to prevent toxic soil and groundwater from migrating into Newtown Creek from beneath the site. Phelps Dodge spent over $30 million cleaning up the property, an amount considered inadequate by some members of the community who wanted a complete remediation of the site at an estimated cost of over $200 million. In 2004 construction began on the now completed Restaurant Depot, a 75,000 square-foot wholesale food warehouse franchise. The properties just east of Restaurant Depot are used by Boston Coach and Galasso Trucking as storage lots for their vehicle fleets. 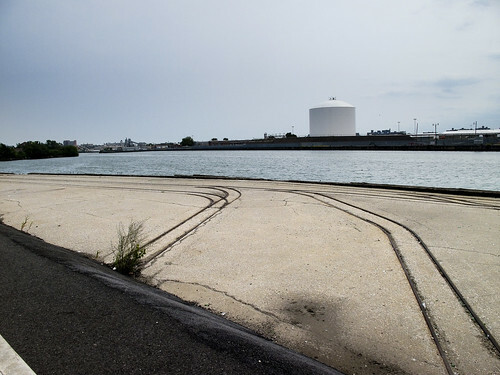 The Phelps Dodge Laurel Hill copper smelter may now be history but its toxic legacy continues to live on in the sediments and surface waters of Newtown Creek. To date, Phelps Dodge has yet to take any responsibility for, and begin removing, the toxic waste they dumped into the Creek for over a century. In February 2007, Phelps Dodge refusal to clean up the Creek lead the Attorney General of New York, Andrew Cuomo, to announce his intention to sue them for endangering the “health and the environment in Newtown Creek and portions of the adjacent shoreline”. Crossing the tracks (this is a city sidewalk, 43rd street and 57th avenue), i walked back into the parking lot of Restaurant Depot (which is a “public area” on private property). This was dumb, and borderline trespassing, but I was prepared to go inside the store and buy a gross of strawberries if I had to. Just a customer, Mr. Security Guard… Hopefully- this is one of the parts of Newtown Creek known for its love of photographers and its ribald sense of humor. The hair on the back of my neck was standing up so I just kept moving, and snapped my shots as I walked. I knew a security camera or two was on me and didn’t want to wear out my welcome. There were rail tracks here once, on the docks. Wow. Just wow. I kind of figure I’m not going to be seeing the Kosciuszko bridge for much longer. Its scheduled to be replaced, so I’ve been trying to record its last seasons in some detail. This is still in the Restaurant Depot parking lot, but I’m already walking a bit faster. Hidden eyes were keenly felt- sorry security guys. Looking back at 57th avenue, from down under the Kosciuszko bridge (DUKBO)- I turned back onto 43rd street, and hurriedly made a left onto 56th road. Continue in the western direction toward the intersection with Laurel Hill Blvd. 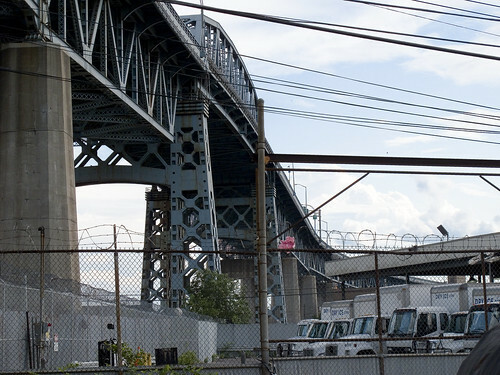 High above me, the Brooklyn Queens Expressway crosses the Kosciuszko Bridge. On the easterly side of the street is a police tow yard. For those of you reading this from outside the City of Greater New York, this is a great example of the macabre logic that the City operates under. The one tow yard in all of Queens is at one the most inaccessible by mass transit, seldom traveled to, and hard to find spots in all of Queens. 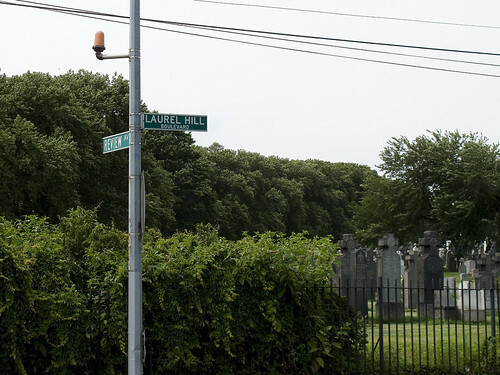 I consider this corner- where Laurel Hill Blvd. meets 56th rd. 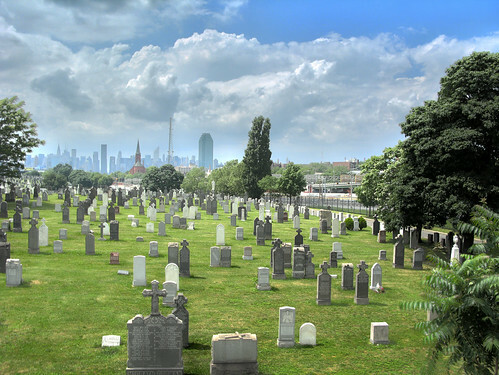 and Calvary Cemetery to be a Long Island City, Laurel Hill, and Maspeth bordeline locus point. I’m sure this is also my personal opinion, and that I’m probably wrong. All I can say is that it feels like a border between the neighborhoods. On the Newtown Creek side of Laurel Hill Blvd. are a series of heavy industry sites. One or two are available for sale or development, if you’re interested in buying 200 years of ecological damage. 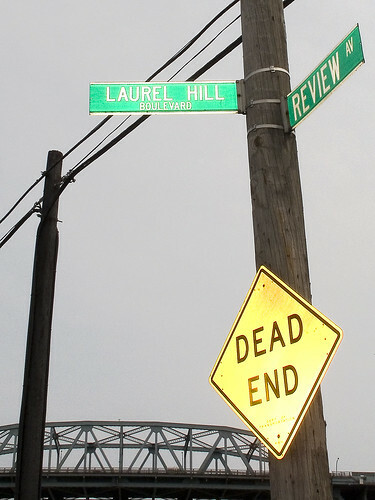 When we arrive at Laurel Hill Blvd, corner of Review- the signs are clear. 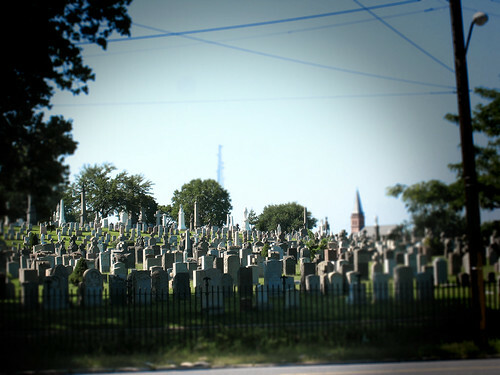 Just look across the street, where the gates of Calvary Cemetery beckon (and which we’ll be exploring in the next installment). 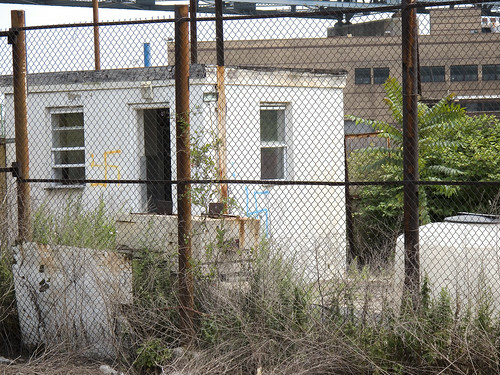 Or look behind you, at the sadly neglected site of the historic LIRR Penny Bridge station. Nazi grafiti has appeared here just recently. This sort of ugly street iconography has been appearing all over LIC and Greenpoint lately. Not too worried about it, as New York City has a way of squashing bugs when they scuttle across the floor. These guys are going to get caught in the act, and if they are very lucky, it’ll be by the cops. Believe it or not, there is a wide world beyond New York City. The John J. Harvey Fireboat passed under the George Washington bridge, and up the Muhheakantuck (or Hudson River, as we palefaces call it). 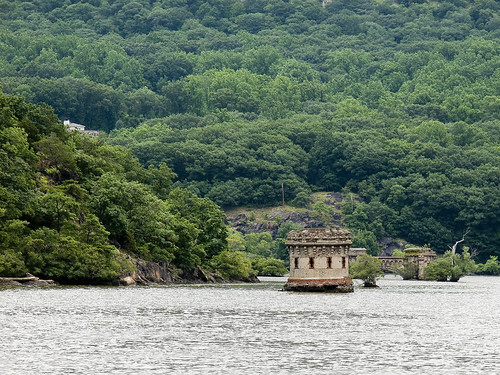 A “drowned river”, the Hudson is actually a marine estuary with strong tides felt as far north as Troy, New York. If one considers the formation as a whole, from its source in Lake Tear of the Clouds all the way to the submarine Hudson Canyon, the implications of its scale are staggering. In the 1920’s the New York City Fire Department’s fleet of 10 steam fireboats was aging, and it was decided to construct a new fireboat with internal combustion power. Basic plans were prepared in 1928. Contracts were drawn up and construction started in 1930 by Todd Shipbuilding’s Plant at the foot of 23rd Street on Brooklyn’s Gowanus Bay. Launching took place on October 6, 1931 with the boat completed and placed in commission on December 17, 1931. Harvey’s dimensions are 130′ long with a 28′ beam and a 9′ draft. She is of steel construction with a riveted hull. Propulsion is by twin screws six feet in diameter. She was the largest, and most powerful fireboat in the world when built. More importantly, she was the model of modern fireboat engineering, and set the pattern for all subsequent fireboats to follow. John J. Harvey was Pilot of the steam fireboat Thomas Willett, assigned to Engine Co. 86 at Bloomfield Street. On February 11, 1930 a fire broke out aboard the North German Lloyd Lines ship Muenchen at North River Pier 42, Morton Street. Willett came alongside and her crew started working aboard the burning ship. Soon a series of terrible explosions tore throughMuenchen. 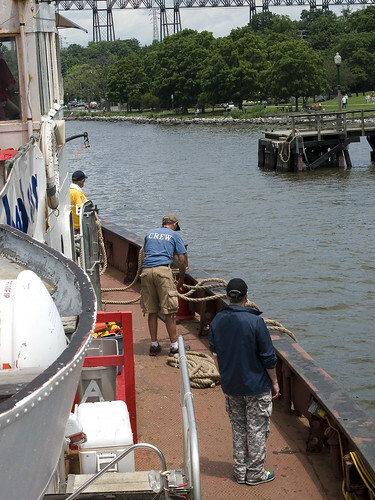 One of the worst caused serious damage to the fireboat and swept men overboard. John J. Harvey, knocked over the side by a section of steel plate, was killed instantly. His body was recovered from the river four hours later. It was quickly announced that the new fireboat to be built in Brooklyn would be named in his honor. This was the first time a fireboat was named for a member of the Fire Department. Harvey’s long life in the Port of New York includes service at hundreds of serious fires, explosions, and marine disasters. One of the first was the five alarm fire that destroyed Cunard’s Pier 54 at West 14th Street in May 1932. In 1942 Harvey worked at the fire that destroyed the French Line’s Normandie, the grandest ocean liner ever built. In 1943 Harvey along with Fire Fighter went into harm’s way to control a raging fire aboard the ammunition ship El Estero. The ship was eventually scuttled, and Harvey’s entire crew received the highest awards for bravery. Harvey has also operated at dozens of major pier fires, in New York as well as New Jersey where FDNY has jurisdiction. She had a distinguished career in the FDNY, from her launch in 1931 to her retirement in 1994. Among the marine fires at which she assisted were the Cunard Line pier fire in 1932, the burning of the Normandie in 1942, the ammunition ship El Estero during World War II, and the collision of the Alva Cape and Texaco Massachusetts oil tankers in 1966. She was named for marine fireman John J. Harvey, who lost his life when a ship exploded during a fire. Her official designation at the end of her career was Marine 2. She was sold, at auction, in 1999, to a private consortium of marine preservationists determined to prevent her from scrapping. In June 2000 she was added to the National Park Service’s National Register of Historic Places. Her current owners have thoroughly restored her, and host frequent free trips on the river. The John J. Harvey had an unexpected encore. During the attacks on the World Trade Center on September 11, 2001, the boat’s owners asked FDNY officials for permission to assist in evacuations from Ground Zero. Meanwhile, firefighters had determined that the vast scale of destruction had damaged many fire mains, depriving fire crews of water. 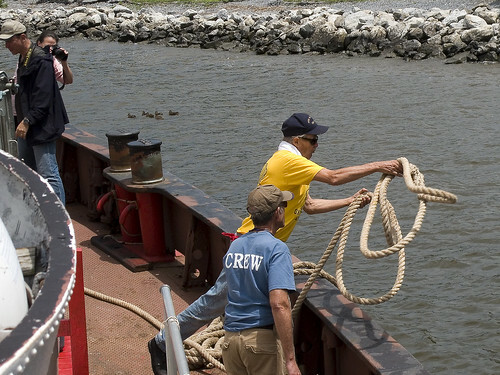 Officials radioed the Harvey to drop off her passengers as soon as possible and return to the disaster site to pump water, reactivating her official designation Marine 2. Alongside two other FDNY fireboats, she pumped water at the site for 80 hours, until water mains were restored. ^ The National Trust for Historic Preservation gave the Harvey a special National Preservation Award to recognize this incident. The Harvey‘s story was the subject of a 2002 children’s book. As the Harvey moved north, we congregated on deck and marveled at the show passing by. The Tugboat Barbara E. Bouchard was moving a barge. A 1992 engenue from the Moss Point Marine Shipbuilding Yards in Mississippi, Barbara E. Bouchard is a slim 591 tons and looks good in red. This is a tug called Falcon, and I’ve got nothing on this one. Had to happen, really. 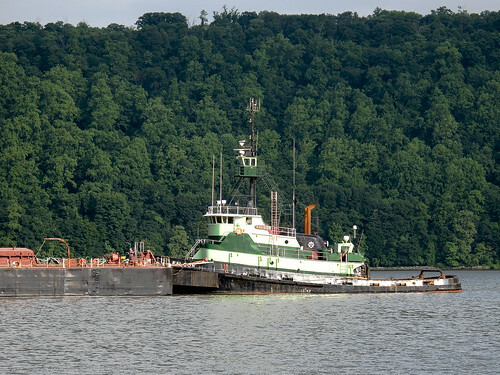 Anyone out there got anything on this tug? Hey Tugster! The New Jersey side of the river, with its impressive cliffs. 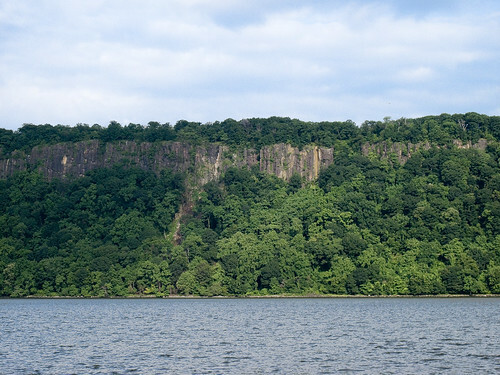 These are hydrologic scars in the earth, the Hudson has been cutting this canyon since the last ice age. 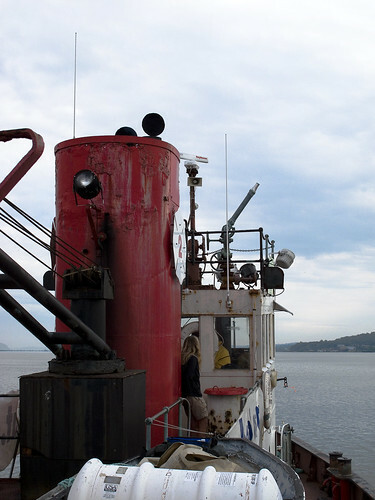 The tug Sea Service, with its barge. 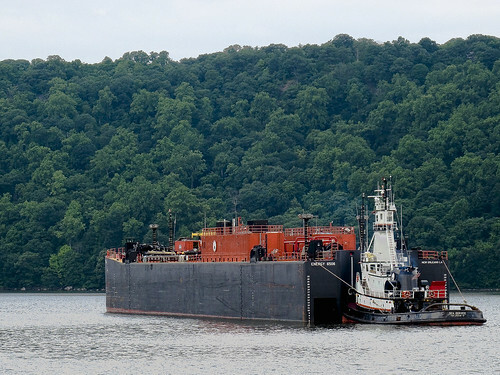 Sea Service was built in 1975 at the VT Halter Marine yard in Mississippi, and weighs 173 tons. It used to known as the “Capt. Paul”, and as the “Sea Star”. The New York Fire Department operated the largest fleet of fireboats. All fireboats before Harvey were steam, all since were diesel powered. The average specifications for these 28 fireboats was about 100′ in length, over 7000 gallons per minute (gpm) pump capacity, with a speed of 15 knots. This list includes all vessels built as fireboats as well as the four tenders Velox, Captain Connell, Smoke, and Smoke II. Tenders were used as auxiliary boats to assist the big fireboats or as command stations for Chiefs. Some tenders had limited pumping capacity. In the late 19th century the City of Brooklyn had a Fire Department almost as large as New York’s. When the two cities were consolidated in 1898, the Brooklyn fireboatsSeth Low and David A. Boody joined the FDNY fleet. 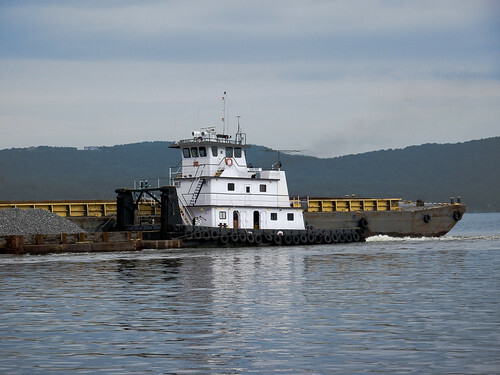 Delivery of the four 105′ boats of the Wilks class, almost completely dieselized the fleet by 1961. 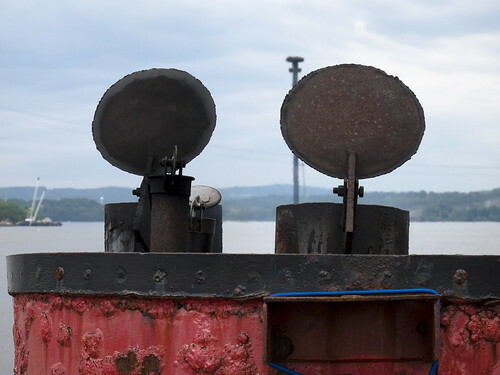 Only one steam fireboat remained on the roster. Starting in the 1960s, FDNY sporadically used some converted commercial hulls in seasonal service in outlying parts of the harbor. Some were equipped with small pumps. These fast motorboats were used primarily for water rescues or emergencies. They are not included in this list. Another class not included here were boats not belonging to FDNY but equipped with pumps that could be pressed into service for firefighting when needed. 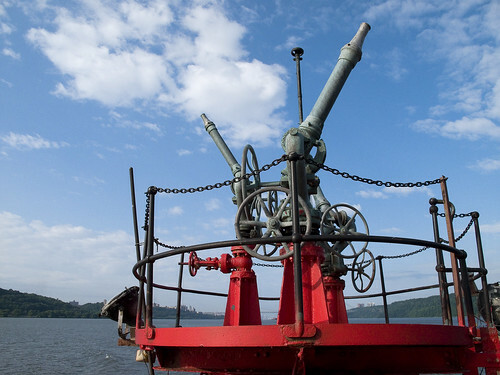 Their use was restricted to the 19th century as the FDNY fleet was being built up. These were the steam tugs John Fuller and Protector, and the Police Department’s steamboatSeneca. In the 19th century the awesome pumping power of fireboats was quickly proven as the only solution to fighting fires that were either uncontrollable or inaccessible with conventional apparatus. The same principle holds true today, and it can still be said that “when you need a fireboat, nothing else will do!”. 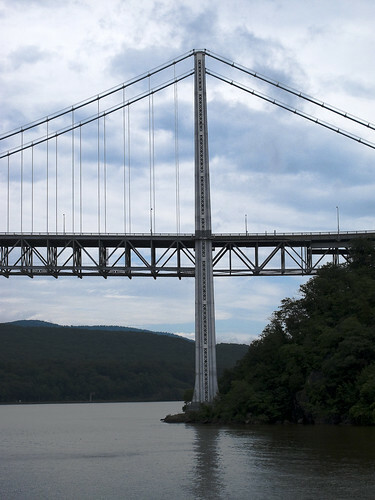 The Tappan Zee bridge suddenly loomed low over the river. My gold standard for reference on New York bridges is nycroads.com. Check out their Tappan Zee page here. 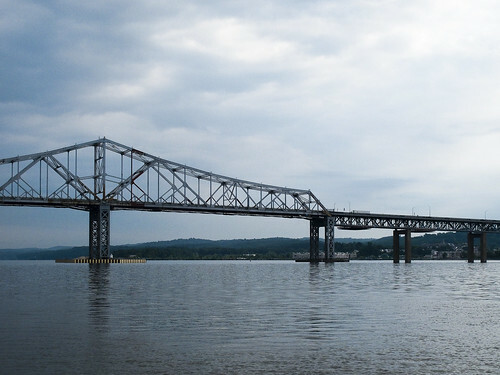 With the increasing demands for commuter travel taxing the existing bridges and tunnels, the Port of New York Authority had plans in 1950 to construct a bridge across the Hudson near Dobbs Ferry. The proposal was overridden by Governor of New York Thomas E. Dewey, who wanted to construct a bridge to connect the New York State Thruway across Westchester to the New England Thruway. 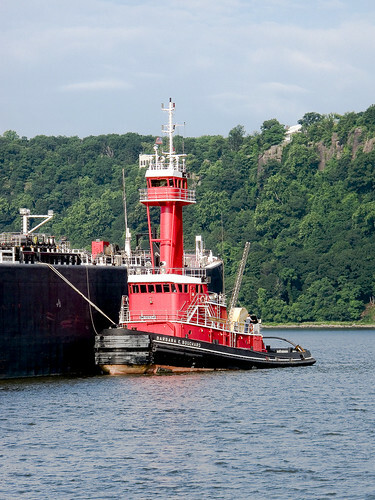 The Port Authority promised its bondholders that it would not allow any other entity to construct a river crossing within its jurisdiction, which reached to a point one mile (1.6 km) south of Nyack and across to Piermont. A May 10, 1950 editorial in The New York Times suggested that a site in southern Dobbs Ferry or northern Hastings-on-Hudson, where the Hudson narrowed considerably from its three-mile (5 km) width at Tappan Zee, would be a more appropriate site, and suggested that Governor Dewey work with his counterpart, Governor of New Jersey Alfred E. Driscoll, to craft a compromise that would offer Thruway customers a discounted bridge fare at a more southerly crossing. 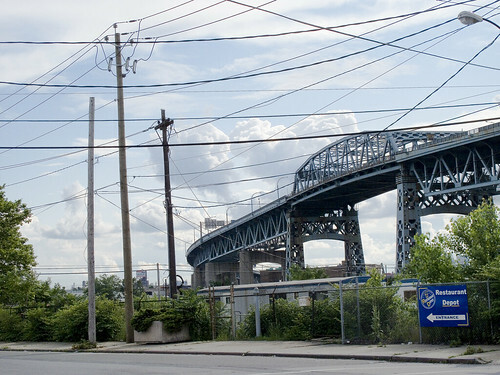 Two days later, Governor Dewey announced that the Port Authority had dropped its plans to construct a bridge of its own. The location would be as close to the Tarrytown-Nyack line just outside the Port Authority’s jurisdiction. Dewey stated that World War II military technology would be used in the bridge’s construction. 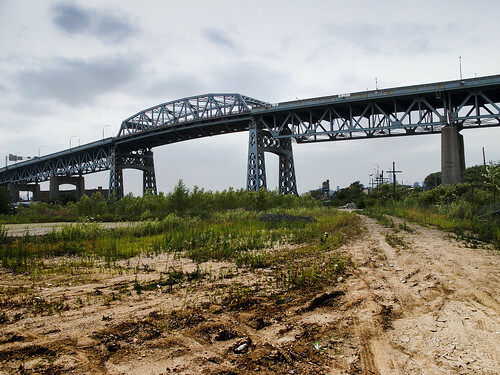 The deteriorating structure, which bears far more traffic than it was designed for, has led to plans to repair the bridge or replace it with a tunnel or a new bridge. These plans and discussions were whittled down to six options and underwent environmental review. Part of the justification for the replacement of the bridge has been that it was constructed during material shortages during the Korean War and only designed to last 50 years. The collapse of the I-35W Mississippi River bridge in Minnesota on August 1, 2007 has renewed concerns about the bridge’s structural integrity. The Metropolitan Transportation Authority (MTA) is studying the feasibility of either including a rail line across the new bridge or building the new bridge so a new rail line can be installed at a future date. The rail line, if built, will be located on a lower level, beneath the car lanes. Commuter rail service west of the bridge in Rockland County is limited, and the MTA is studying expansion possibilities in Rockland County that would use the new bridge to connect with the Hudson Line (Metro-North) on the east side of the bridge along the Hudson River for direct service into Manhattan. 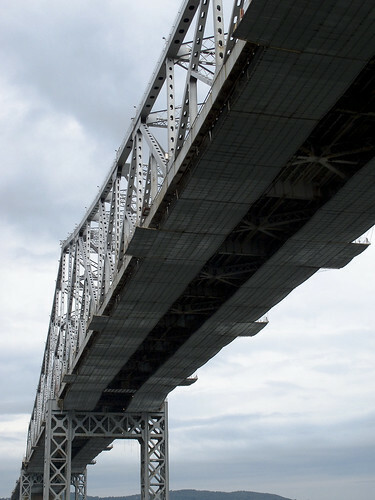 On September 26, 2008, New York state officials announced their plan to replace the Tappan Zee Bridge with a new bridge that includes commuter-train tracks and lanes for high-speed buses. The bridge would cost $6.4 billion, while adding bus lanes from Suffern to Port Chester would cost $2.9 billion. 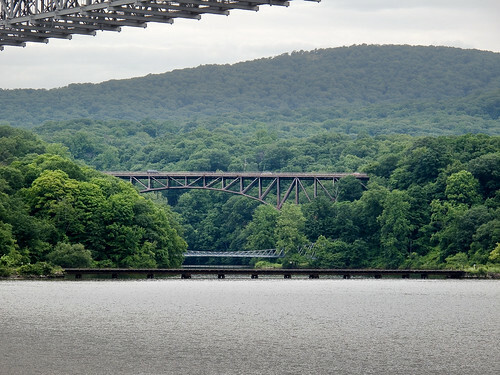 Adding a rail line from the Metro-North station in Suffern and across the bridge, connecting with Metro-North’s Hudson Line south of Tarrytown, would cost another $6.7 billion. The plan is being reviewed for environmental impact. River traffic really started to drop off near the Tappan Zee. After we passed it, the shorelines on both sides of the river began to take on a small town feel. Small town with the occasional barge of fill passing by, of course. Looks lovely, doesn’t it? Why wouldn’t you want to live here? What could it be, perhaps something just around the next bend on the river? 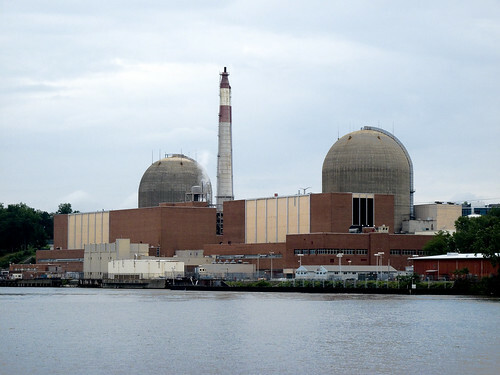 The Indian Point Nuclear Power Plant. I’m a Newtown Creek guy, this is somebody else’s problem. We’re all gonna die of something. Motor on Harvey, away from the three eyed fishes. The Bear Mountain Bridge, New York landing. There’s a train tunnel in the lower right of the shadow, completely hidden in the shadows. 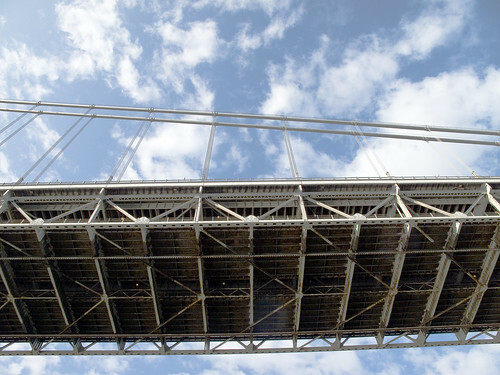 nycroads.com has a great page on the history of the bridge here. This is actually pretty neat, a pedestrian, rail, and vehicle bridge in one shot. 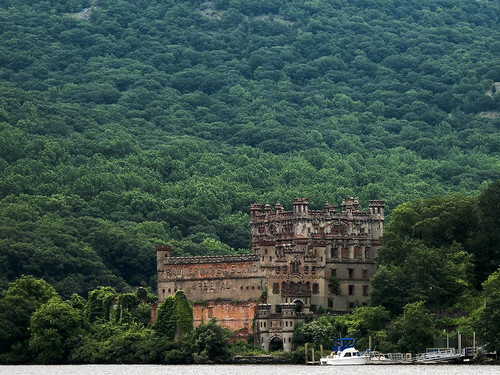 Bannerman’s island. Francis Bannerman VI was a Brooklyn kid of Scottish descent who joined the Union army during the Civil War. At the end of the conflict, massive amounts of military surplus were being auctioned off by the victorious Union. Bannerman bought this surplus and became a successful merchant based at 501 Broadway in Manhattan. By the time that the Spanish American War ended, Bannerman was already a rich man, and the Federal Government sold him 90% of all war surplus in a closed bid. A lot of this surplus was munitions and black powder, which the City of New York did not want him to warehouse within city limits. In the early 1900s, Bannerman’s supply of military goods was staggering. Nations at peace were his customers. Thom Johnson approximates that “50 percent of the commemorative cannons placed in public areas were purchased through Bannerman’s.” And nations at war outfitted whole armies through Bannerman’s. During the Russian-Japanese war, Bannerman’s filled an order for 100,000 saddles, rifles, knapsacks, haversacks, gun slings, uniforms and 20 million cartridges, as well as a shipload of assorted military goods. Collectors claim that the Bannerman catalog is the best book ever written on weapons of war. Published regularly from the 1880s to the 1960s, its approximately 350 illustrated pages feature African arrows with metal barbed points to a Moroccan sheik saddle in serviceable order. They supplied countless theatrical productions with uniforms for costumes, and many illustrators and painters with military detail. But the Bannerman family also understood little boys. They advertised their large, illustrated catalog in the back of pulp magazines in the 1920s and ’30s for 40 cents. 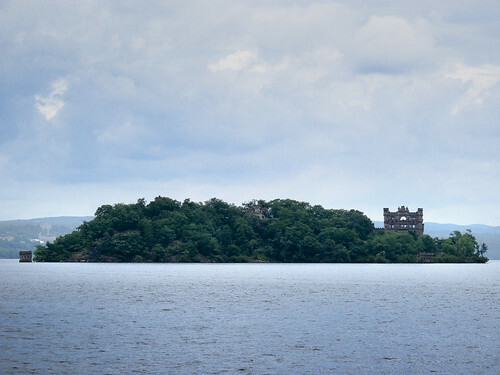 Bannerman built his castle over an 18 year period, at the end of which he died. In 1920, 200 pounds of powder and shells exploded and destroyed part of the castle. It lost its ferryboat in a storm in 1950, and a fire in 1969 rendered the place a abandoned wreck. Its the New York State Dept. of Parks, Recreation and Historic Preservation’s problem these days. The Indians didn’t like this island, with its dangerous tides and reputation of being haunted. There’s meant to be a ghost called Polly Pel in residence, named for the Dutch nomenclature of the landmass- Pollepel Island. 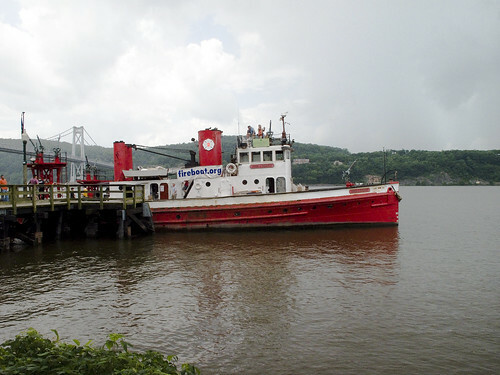 The Harvey at last made it to Poughkeepsie, and the Crew began preparing to dock. As you can see, the ship was lousy with photographers. Got it in one toss. Sweet. We disembarked in Poughkeepsie, and left the Harvey to its business. The Crew said that they would be participating in 4th of July celebrations through the next day, including a laser show. 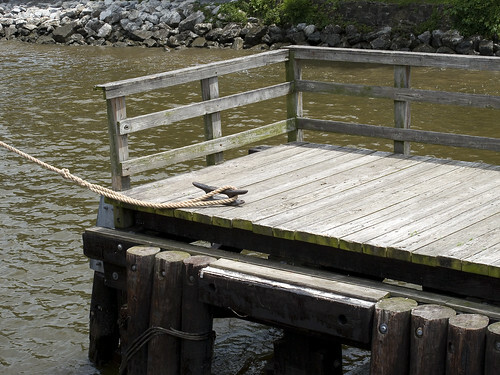 The John J. Harvey is in dire need of both physical repair and financial support. Visit fireboat.org for information on the Harvey and what you can do to help out. Next posting- We return to Queens and Newtown Creek. Also, some exciting new information has come to us on the Hook and Ladder 66 building on Northern Blvd that I’ll share later this week.